The Diary of C.Raja Raja Varma, a journal kept by Raja Ravi Varma's brother, is one of the most important and authentic source materials on the last ten years of the life of Raja Ravi Varma, one of India's most famous artists. C. Raja Raja Varma was co-worker, assistant, secretary, and business manager to the renowned artist. Their symbiotic relationship is well known, and they are often referred to as the Ram and Laxman of Indian art. This diary, available in its full and authentic form for the first time, is a huge source of information on the accomplishments of Ravi Varma and the working of his Ravi Varma Fine Arts Lithographic Press over a ten-year period, 1894-5 to 1905. Over 1000 entries accompanied by a colour place section of rare photographs, paintings, drawings, and art magazines of the period, showcase the artist's method of working and the influences on his art. This journal, which began as a travelogue during Raja Varma's tour with Prince Martanda Varma in 1894, mostly chronicles the Varma brother's journeys while they attended to their flourishing portraiture business. It also contains the only reliable source material on Ravi Varma's great industrial enterprise, the Ravi Varma Fine Arts Lithographic Press. This press, founded in Bombay in 1894, had an overwhelming impact on modern Indian aesthetics. It introduced a king of visual imagery, which until this day defines the parameters of popular Indian visual media, especially the now much talked-about Indian calendar pictures, and also modern visual media such as cinema and television. The diary gives an insight into the internal business of the Ravi Varma Press, particularly the separation of the partnership between the Varma brothers and their final transfer of ownership of the Press into the hands of the German master printer Fritz Schleicher. Accompanied by extensive notes and a chronology, The Diary of C.Raja Raja Varma will be an invaluable reference to scholars of Indian art, art lovers and critics, and will appeal to the general reader in India and abroad. Erwin Neumayer is an archaeologist and ethnologies. He has written on the prehistoric rock art of India, and - together with Christine Schelberger - is the author of Popular Indian Art: Raja Ravi Varma and the Printed Gods of India (OUP, 2003). Erwin Neumayer lives in Vienna. Christine Schelberger is an artist who teaches art and art history in Vienna. Erwin Neumayer and Christine Schelberger present here a valuable historic document, the diary of Raja Varma, the first Indian landscape painter, which has been known in fragments for quite a while but never before published as a complete text. I used fragments of the diary for my book, Art and Nationalism in Colonial India 1850-1922 for which I did my research in the 1980s. My research on Ravi Varma had led me along a complex and meandering path, and eventually to the diary preserved by various members of the artist's family. It was thanks to the kindness of several members of the family that I was able to use the various pieces of the diary in my work. Neumayer and Schelberger have already compiled a small and valuable illustrated booklet on Ravi Varma's studio in Kilimanur and have also organized exhibitions of Ravi Varma's oleographs. The publication of these diaries, I feel confident, will be of immense value to scholars and of great interest to the general public. 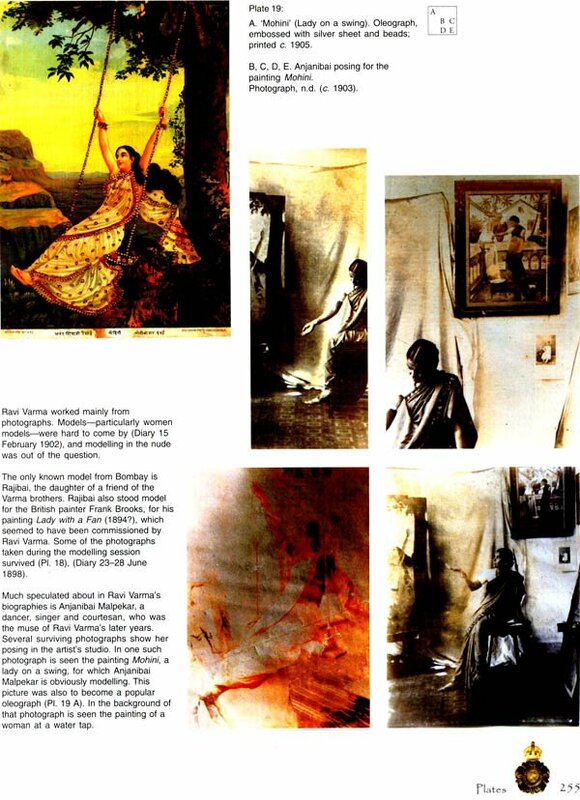 Not only does the diary illuminate the life and practice of Ravi Varma as recorded by his brother Raja Varma but also the painting methods of Raja Varma himself, who was an early landscape painter in India. It presents before us the efficient business enterprise that was the fashionable portrait practice of the Varma brothers and helps dispel the myth of Ravi Varma's lonely eminence; there are stories of his never having received help from anyone. Indeed the portraiture enterprise of the two brothers reminds us of the Victorian salon artists, and above all the great French sculptor, Auguste Rodin, who had set up a complex organization in Paris to supply the public with his sculptures. The autobiography as a genre is associated in Europe with the Italian Renaissance whose liveliest example was the celebrated autobiography by the sculptor and goldsmith Benvenuto Cellini. Autobiographies mark the growth of individualism, introspection, and an ability to reflect on the external world. In India, the earliest and best-known autobiographies date from the sixteenth century. They were written by members of the remarkable family of the Mughal emperors, notably Babur, founder of the dynasty, the aesthete Jahangir, and several ladies of the harem. Autobiographies of artists did not appear in India until the growth of artistic individualism during the colonial period, and they were modelled on the diaries of Englishmen and Englishwomen. In colonial times, several well-known artists, notably the landscape artist Abalal Rahiman (1860-1931), Mahadev Visvanath Dhurandhar (1867-1944), the leader of the nationalist Bengal School, Abanindranath Tagore (1871-1951), and K. Venkatappa, (1887-1965) a pupil of Abanindranath, wrote down their experiences and artistic ideas in diaries and memoirs kept by them. Among these, Abanindranath Tagore's memoirs in Bengali, especially Jorasankor Dhare, were published soon after his death and are regarded as literary masterpieces in their own right. However, the earliest known diary by an Indian artist was the one kept by C. Raja Varma, younger brother of Ravi Varma, the most famous academic artist of India. To understand the reason for the rise in the trend of maintaining diaries among Indian artists, we need to consider the transformation wrought by the introduction of colonial institutions such as art schools and art societies during the British Raj. Artistic outlook and practice, genres of art, as well as the status of artists underwent profound changes during the colonial period. Previously in India, the artist had a low status, and the distinction between artists and artisans was ambiguous. 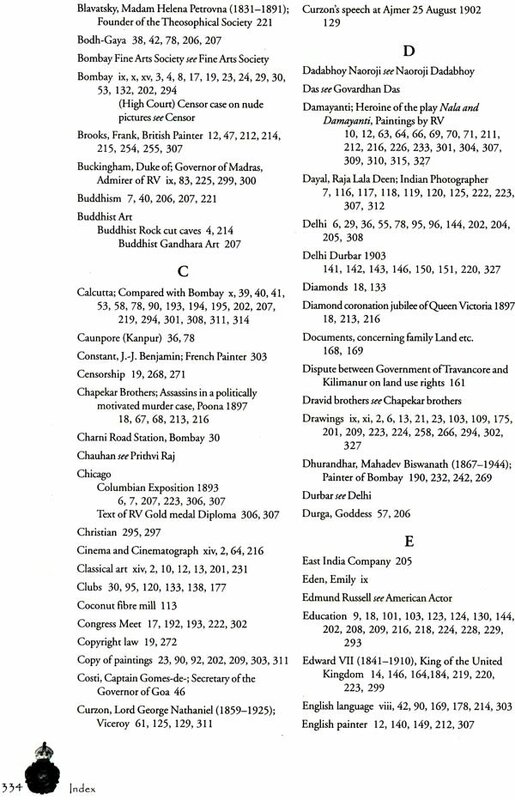 We have clear evidence of the appreciation of artists by the Mughal emperors, who conferred high honours on them. Nonetheless, their status was ultimately dependent on the emperors' wishes. After his apprenticeship under a master, the Mughal artist became part of the royal entourage. Often born in the royal household, even the most accomplished were addressed as khanazad or second- generation slaves. During the colonial era, the status of artists became elevated as they were no longer tied to aristocratic patronage. The new Western-literate, self-conscious graduates of impersonal art schools now looked to the public for appreciation, though not necessarily for financial support. One way of gaining publicity was through art exhibitions organized by art societies-Vicrorian cultural institutions used effectively by the Raj for the spread of Western academic art. Two further elements were modern journalism and cheap prints, which helped diffuse Western academic art throughout India, even among ordinary people. The rise of academic artists in India owed largely to the spread of English literacy, as the new elite artists, imbued with artistic individualism, sought inspiration in European romanticism and, above all, in the image of the artist as a lonely outsider relentlessly pursuing a transcendental idea against all odds. A remarkable example of this was the landscape painter Abalal Rahiman of Kolhapur. However, no one embodied this new idea of artistic genius more strikingly than the academic painter, Ravi Varma (1848-1906), a minor prince from Kerala who rook the unprecedented step of choosing a profession hitherto regarded as unworthy of the upper classes. 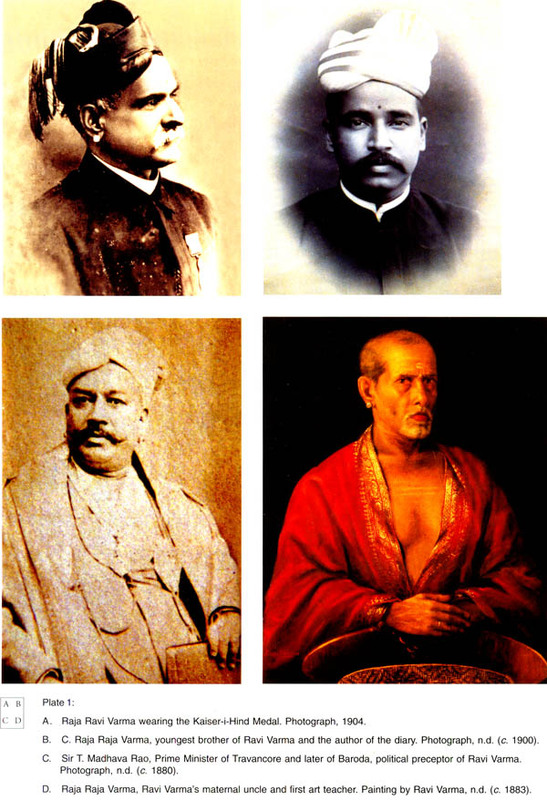 Varma made his reputation with fashionable portraits which took him allover India and won him clients among the British rulers and the Indian aristocracy. From portraits he moved on to historic paintings that secured his lasting reputation. Ravi Varma's artistic project was part of a burgeoning national consciousness, as improved communication and better printing technology brought the Indian elite closer together. Finally, Varma released cheap prints of his most celebrated historic paintings, thus winning a permanent place in the nation's heart. The diary maintained by Raja Varma is one of the most valuable sources for first- hand information on Ravi Varma's life as a professional artist, and enables us to corroborate many of the events in his life and his achievements, hitherto known mainly through myths and hearsay. In 1895, Ravi Varma set up his studio in Bombay with his brother C. Raja Raja Varma, as a business enterprise fashioned on the practice of European academic artists. Raja, the younger brother by several years, became his constant companion, collaborator, and amanuensis, as they built up a lucrative practice. He documented their lives together from that year until his death in 1905, in a personal diary of daily events. From the detailed accounts in the diary, we can reconstruct the career of Ravi Varma as we get an insight into his artistic practices. Contrary to the myth of Ravi Varma's lonely eminence, the diary reveals their portrait practice as a collaborative enterprise. Raja Varma also published a more formal account, 'A Narrative of the Tour in Upper India of His Highness Prince Martanda Varma of Travancore', based upon the diary, modelling himself on earlier English diarists like Emily Eden. 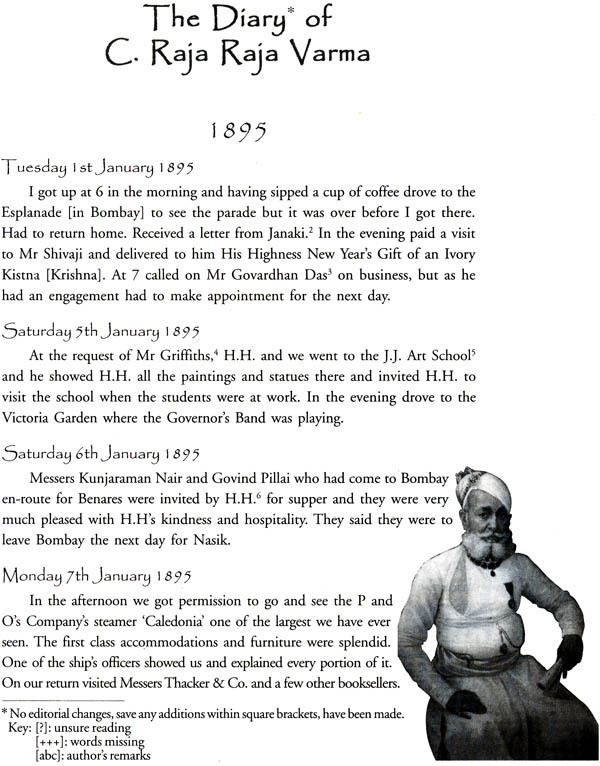 The diary contains delightful nuggets of candid opinions on other artists, like for instance John Griffiths, who was a teacher of paining at the J.J. School of Arts in Bombay during 1865-95. But arguably most valuable are the insights the diary offers on the Western representational drawing and painting methods of the Varmas. As E.H. Gombrich has shown, the use of a simplified 'schema' and its constant correction underlies the capturing of a successful likeness in a European naturalist portrait, or the veracity of a naturalist landscape painting. Passages in the diary of Raja Varma reveal how he constructed his landscapes based on this method. For instance: 'The trees in my picture were quite spoilt and I [am not sure?] of being able to mend it. It looks hard and wanting an atmosphere.' Two days later, he succeeded in improving the work, though 'the trees in the middle distance [were] found [to be] most difficult to manage'. The same problem-solving outlook is evident in an Udaipur landscape, where Raja 'changed the water in [his] sketch to a calm surface with reflections of buildings in it. It [was] certainly an improvement, as water in motion [was] most difficult to paint'. In their portraits too, the brothers kept retouching until they felt satisfied with the likeness, yet again a normal European practice. Until much later, the senior partner, Ravi Varma alone was entrusted with doing the face in a portrait. Indeed, the portraits confirm Ravi Varma's unusual knack of capturing likenesses. The Duke of Buckingham is said to have remarked that he had once given eighteen sittings to a European painter, who was unable to do half as well as Ravi Varma with so few sittings. The brothers owed part of their professional success to their network of friends and agents throughout India. At Udaipur, the brothers' intermediary was Fatehlal Mehta, a confidant of the Maharana, 'with whom we had a long correspondence on the subject of our visit to this state'. In Mysore, they appointed an agent to look after their interests. There is evidence that their reputation was not created overnight, but through patience, enterprise, and a punctual fulfilling of contracts. As with their business acumen, the brothers' social life and artistic outlook were a mixture of Western and Eastern elements. Salon artists, such as ].-L.-E. Meissonier, were their artistic role models. The professionalism of Ravi and Raja Varma reminds us of Victorian painters. Throughout his career, Ravi Varma adhered to a work ethic, which was alien to his semi-feudal milieu. Yet, his Hindu persona took him on pilgrimages and made him plan his retirement at sixty as prescribed by the sacred texts. His greatest desire was to go abroad to study Western art, a wish that remained unfulfilled because of his fear of losing caste. At this time, few Hindus dared defy caste injunctions to cross 'the black waters'. We can learn a great deal about the professional routine of the two artists from their life in Bombay, where they lived the summer and monsoon months in order to complete commissions, returning to Kerala every year in autumn. Ravi Varma's day began with a ritual bath and prayer, followed by a long working period, punctuated by an afternoon siesta. The work was efficiently divided into portrait commissions with tight deadlines, and the more leisurely production of works for exhibitions for the art societies of Bombay, Simla, Madras, and Calcutta. While Ravi Varma concentrated on mythological pictures, Raja painted landscapes when he was not assisting his brother with portraits. They spent their leisure hours browsing at local bookshops, entertaining friends, and occasionally visiting the theatre. In 1901, the Varmas saw a performance of Romeo and juliet in Hindustani. In this period the Parsi theatre was popular in Bombay. There were complaints in the diary about dull Sundays, especially wet ones, when the newspaper, which had become 'as indispensable as one's morning coffee or tea' would not be delivered. 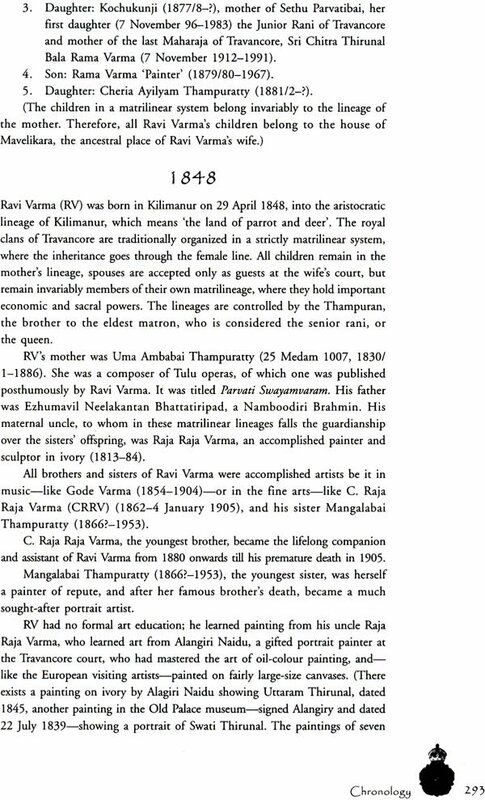 The Diary of C. Raja Raja varma is the most important and authentic source material on the last ten years of the life of the famous Indian painter Ravi Varma (1848-1906). The chronicler of this diary-his youngest brother C. Raja Raja Varma-was his artistic co- worker, assistant, secretary, and business manager until his premature death in 1905. Their symbiotic relationship was something that was very much acknowledged by their acquaintances, who called them the Ram and Laxman of Indian art. Although Raja Varma's own contribution towards Indian art-particularly his talent for landscape painting- is hardly known, he thrived solely in the shadow of his overwhelmingly famous brother. Ravi Varma (Plate lA, 3) was, during the last quarter of the nineteenth and in the early years of the twentieth century, the most famous artist of India. He was portrait- maker to the Indian and Anglo-Indian aristocracy and a visualizer of national mythological scenes, which he transferred to large-sized, gilt-framed canvasses. As an Indian, he became famous after he broke into the realm of producing highly prized art, where hitherto, only European painters had dominated. He applied his own particular style of academic mythological realism on Indian epic themes and envisioned them anew for the feudal aristocracy and the newly evolving and acutely westernized urban middle class. As a member of the high aristocracy in his native Travancore, Ravi Varma broke away from the age-old tradition of his class-the practice of applied or performing arts as a pastime-but instead faced competition within a new, socially heterogeneous arts and crafts movement, which was all set to provide the symbols of the new imperial order. His fame and popularity stems not only from his artistic qualities, but also from his path-finding visualization of Indian mythology. It was he who first employed European techniques and aesthetics to depict scenes from the great Indian epics and from other ancient literary sources. The largest commissions for Puranic paintings were ordered for the palaces of the tremendously rich Maharajas of Mysore and Baroda, who acquired them by the dozens to decorate their newly built palaces. Only in rare cases were these paintings put up for public viewing. Whenever Ravi Varma held an exhibition of his paintings, he could be assured of the type of journalistic attention that guaranteed wide publicity. So much so that such exhibitions turned out to be festivals of a yet unheard-of kind: a mela for paintings, where the star painter himself would be present to give darshan like a demigod-very much an early version of the public appearances of movie heroes of modern-day India. Postcard-sized photographs of Ravi Varma's paintings were widely distributed and accepted as religious icons. During the 1890s, Ravi Varma saw the commercial potential of publishing quality prints of his pictures for distribution all over India. Here again, he wanted to establish his imagery in a market which was hitherto monopolized by German oleographic prints, most popular of which were the dramatic scenes from European classical literature for the more culturally inclined, and prints of semi-clad women in tempting postures for the more irreverent. This genre of display prints blurred the demarcations between categories such as the profane/patriotic/pathetic/sensual/sacral, etc. The word 'kitsch' had not yet entered the lexicon, but had it existed, it might not have even encompassed the whole meaning of this art. The genre pictures which Ravi Varma prepared to be lithographed remained very close to their German forerunners in sentiment and gesture, so much so that in many instances, his heroines and heroes seem to be little more than Indianized stage workers in front of mildly orientalized backdrops. His 'Ravi Varma Fine Arts Lithographic Press' was, for years to come, the largest and technically most innovative commercial press in India. From the Ravi Varma Press, millions of mythological pictures were churned out and distributed all over the world wherever Indians had settled. By 1900, Ravi Varma pictures were indispensable decorations or religious icons in every 'cultured' home of India. Although the Press was no financial success for Ravi Varma personally, it was instrumental-as no other medium of mass communication before-in introducing a pan-Indian system of visual aesthetics. A new vocabulary of imagery became so deeply ingrained into every aspect of Indian art, that later, visual art, be it applied or performing art, or even cinema and later television, had to adhere to the canon of expression introduced by Ravi Varma's oleographic prints. These prints gave to the fragmented social and cultural landscape of India-the India of many languages, scripts, religions, and social practices-a uniform visual system, modelled on the aesthetics generally identified with the British overlords; for once, these visuals did not encounter any nationalistic cultural resistance. And when in later years Ravi Varma's art was attacked for being hybrid and lacking in Indian sentiment, this did not dent the popularity of these pictures in every section of Indian society. Gods and goddesses had been already visualized through the Ravi Varma prints, those images deeply engraved in the Indian subconscious, and Ravi Varma himself had become a legend, an artist such as India had never known before-nor after! Ravi Varma's biographical sketches appeared in many Indian newspapers during his lifetime. Most of these were authorized by the artist himself, or were edited and published by persons very close to him. Although these sketches are important sources of information on the life history of the artist, they contain perplexities and blatant misinterpretations of Ravi Varma's work and intentions. Such mystifications are a professional necessity for a freelance artist-and Ravi Varma with his aura and fame was no exception, since he had to provide his clientele not only with illusions painted on canvas, but also the illusory exclusivity of a genius and his art. Art history, however, posed other questions. Therefore, the rediscovered diaries of C. Raja Raja Varma uncover a wealth of information and authoritative confirmation of around ten crucial years when Ravi Varma founded his lithographic press in 1894-5, until his brother's premature death in 1905. 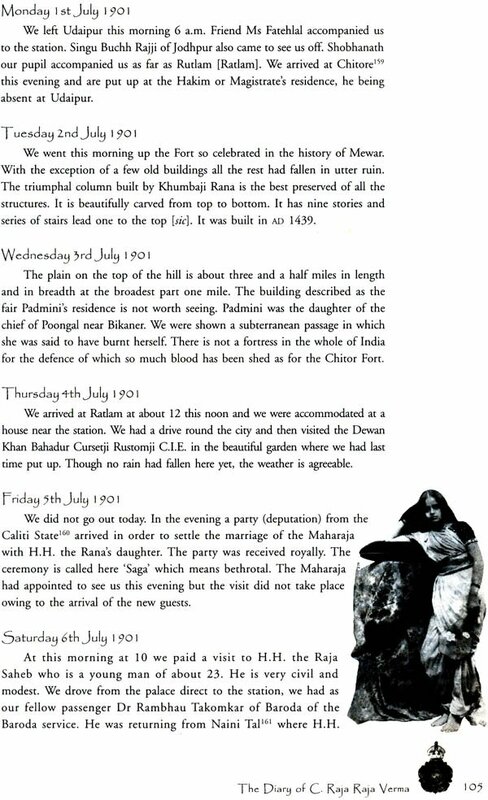 The diaries throw light on the social surroundings in which the Varma brothers moved and worked in Bombay, as also their assignments at many of the princely courts of India. C. Raja Raja Varma (Plate 1 B) began the diary as a collection of preparatory notes for a travelogue, fashioned on the accounts of European gentlemen travellers on the tiger- shooting and elephant-hunting circuit in India. It was meant to have been published after the upper India tour undertaken by Prince Martanda Varma, along with Ravi Varma and Raja Varma, and a retinue of fifteen other persons during the cool season of 1894-5. Although the book was never published, the completed manuscript, entitled 'A Narrative of the Tour in Upper India of His Highness Prince Martanda Varma ofTravancore' (Varma, C.R.R., 1896) was privately circulated one year later. From the following year, no diary entries seem to have been made. The diary appears to have been continued only in May 1898 and entries were made regularly until August the same year. Thereafter, Raja Varma kept up the habit of making daily notes when on a journey. It was only during the years 1902 and 1903 that daily notes were written even in his native place. Intimate family information is therefore available only from this period onwards; otherwise, family matters are dealt with only in a very peripheral manner. Hence, the 940 diary entries, coming from one of the shapers of modern Indian art and mass communication, provide valuable documentation from the period around 1900. Complementary to the rediscovery of the diary was the discovery of a library chest full of art magazines and art books, several of which were mentioned in the diary. This material shows that Ravi Varma functioned in an art world, which had by then already conformed to the now so often used criteria of a global village. There were predecessors to Ravi Varma in his native Travancore, who painted in oil on canvas. Long before Ravi Varma took up the brush, Alangiri Naidu had mastered oil painting on large-sized canvases, which immediately throws up the question about whom Naidu learned from, particularily since he produced works far superior to anything Ravi Varma produced for a long time. Naidu's works were of course seen only in the confines of the palace halls and in minute ivories, never to be seen by a larger audience. It is not known how he came to master oil painting. A successor of his, Ramaswami Naicker, was an inferior artist and tradition has it that he denied Ravi Varma any help when approached by him to disclose the secrets of oil painting. Naicker's assistant, Arumugham Pillai, did disclose some of the trade's secrets to the young Ravi Varma clandestinely (as legend has it), in the dead of the night. Arumugham Pillai's works did not survive for us to judge the quality of the help he was able to render. Nevertheless, one thing is clear: Ravi Varma was not the self- created genius from the backwaters of Travancore who struggled in basically artless surroundings-as he is projected by some rather well-meaning biographers- but a talented painter with an admirable determination to transcend social hurdles and use the advantages of high birth to claim a place for himself as a professional painter. And a painter he was. In the widening network of communication between socially disparate gentlemen artists and their patrons, Ravi Varma with his popular pictures, bridged the gap between the scientific study of ancient Indian history and literature, and nascent Hindu nationalism. The pictures were accepted on account of their high idealism as the anglicized middle class understood it, and the veneer of Indianness was considered indigenous enough to be taken as a true national model. The library mentioned earlier also contained a number of studio photographs indicating the working methods of the artist. The historical photographs depict many of the people who are mentioned in the diary. The authors are deeply indebted to the descendants of Ravi Varma in Kilimanur, Mavelikara and Cochin, who allowed them, in the most open manner, to view and research their private libraries and collections. Our thanks are also due to the members of the Royal Family of Travancore, who gave us access to their collections in the Kowdiar Palace, Trivandrum. The joint secretaty of culture of the Government of Kerala as well as the director of archives allowed us, within short notice, to view some of the original communication between Ravi Varma and the former Travancore state concerning the proposed art gallery. Our sincere thanks to Mr Lal Lukose of Trivandrum, who sat with one of the authors patiently, for weeks on end, to translate Malayali manuscripts and books. The heir of the premises of the Ravi Varma Press in Malavli, Dr Peter Sahu extended his hospitality to us, opening the press premises and showing us some of the original litho stones as well as papers related to transactions of the Press in its founding days. To all of them our sincere thanks. C. Raja Raja Varma's name and art are only known within the narrow confines of art historians dealing with modern Indian art. Even so, his landscape paintings are housed in several of the grand museums and collections of contemporary Indian art, where these pictures, of rather unassuming sizes, have the power to capture the attention of the beholder on account of their almost impressionistic use of pigments. The quality of these landscapes is superior to any other works of an Indian painter in that genre and of those times, not excluding his overwhelmingly famous brother Ravi Varma. Less known still is that a good deal of the portrait works attributed to Ravi Varma during the period from the 1880s onwards is the joint work of both the Varma brothers. This cooperation lasted until the death of Raja Varma, although few works are signed by both artists. Ravi Varma's signature, by then, was an indispensable and widely recognized trademark, denoting the ultimate in luxury and prestige within the milieu of his clientele, the Anglo-Indian administrative aristocracy, the urban-based Indian capitalists, and the native feudal aristocracy. The fluid signature of Ravi Varma became the seal of a highly prized commodity. Who, now, was C. Raja Raja Varma, whose diary is placed here for the first time before a larger audience, and what is the importance of this document for the history of modern Indian art? Raja Varma's vita is inseparable from the life history of his famous brother Ravi Varma, whose assistant, secretary, and life-long friend he remained till his early death in 1905. The documentary sources about his life are basically the same as those that tell us about Ravi Varma. Ravi Varma was the most famous Indian art personality during the last quarter of the nineteenth and early years of the twentieth centuries. He was the undisputed grand seigneur of Indian art, who, with his large epic oil paintings, visualized and set the theme for the resurrection of a pan-Indian mythology. His path-finding role, together with his personal aristocratic nimbus, allowed him to work in a highly remunerative market, which hitherto, had been open only to European artists. With all his fame and his own blue-blooded standing, he functioned basically as a freelance artist exposed to the unbridled tempers of his upper-class clientele. They would either subject him to overbearing hospitality, or degrade him by having him deal with the ignorance, corruption, and jealousy of petty court officials and a coterie of lackeys, often ignoring his skill as an artist. These facts are well documented from the sojourn in Hyderabad (Diary 30 March 1902). Ravi Varma had to bow to all this in a professional manner. Indeed, little is known of the professional life of Ravi Varma. The reasons for this are manifold. During his lifetime, the artist authorized several biographies and life-sketches written by friends and well-wishers. These can be taken as interesting hagiographies, useful only for the study of stereotypes among modern artists: a child prodigy in drawing who practised on whitewashed walls with charcoal pieces pinched from the palace kitchen, almost became the spouse of a princess while still a child (which would have meant spending his days in the golden cage of the court), who struggled against the aristocratic miliekju to take up painting as a profession, and so on. Ravi Varma worked with oil colours, which in these biographies is generally projected as a pioneering accomplishment on account of which he is addressed as the first modern artist in India. However, these biographies have to be seen for what they were- advertisements by and for the self-conscious personality of an artist, who not only produced art but also created his own market environment. In that he was most successful, a personality of modern art such as India had not produced before. What is important for Indian art history is that Ravi Varma, besides his thriving portraiture business and commissions for mythological themes, also began the industrial reproduction of his mythological pictures in his Ravi Varma Fine Arts Lithographic Press. With these prints, he was able to address a wide and socially heterogeneous Hindu audience; he visualized their mythology in a pictorial code confined until then to the colonial and aristocratic echelons of the middle and upper classes. The mass impact of these prints was such that every later visual medium had to adhere to their aesthetic frame, be it the national Indian cinema or even later, the indigenous brand of Indian television. Ravi Varma accomplished what no other artist before or after him was able to do on that scale: he acted as producer, communicator, and distributor of the most potent visual mass media in the most populous continent at that time. His oleographs stabilized and unified Indian visual imagery to such an extent that he can be called its founding father. Ravi Varma as an artist might be considered as one of the early Indian gentleman artists during the nineteenth century who tried their hand more or less successfully in the art and technique of the colonial masters. But what he really succeeded in was the dramatization of the classical Indian epics in pictorial art and its broadcast in the trivial medium of cheap display prints. He accomplished this task with imported machinery from Germany. The Ravi Varma Fine Arts Lithographic Press was, for some time, the largest picture printing establishment in India, and also the most innovative. Several German technicians looked after the servicing and working of the machines and so took part in the formulation of the modern Hindu pantheon. And since art is as much defined by technique as by creative genius, the part played by the technicians in the visualization of the new image of gods should not be overlooked. Indeed, the history of mass production of trivial prints and the virtual monopoly of that industry which was held by Germany during the nineteenth and early twentieth centuries is an important key to understanding the development of printed imagery in India as well. From the very beginning, the Ravi Varma Press was under the technical control of the German printer Fritz Schleicher (Plate 29), who eventually became the owner of the Press after 1903. Ravi Varma ran the Press as an absentee artist, with virtually no control over financial dealings, which were in the hands of his business partner Govardhan Das till 1898. After the disastrous years of the plague in Bombay, when the Press lay idle for most of the time, the two parted ways, and Ravi Varma had to buy his partner's shares for the huge sum of Rs 22,000, which had to be borrowed from friends. The Press was, at that time, situated in Ghatkopar on the outskirts of Bombay. Ravi Varma and his brother used to stay in a small bungalow up in the hills in Malavli whenever they visited the Press. Bombay was just a couple of hours by train in those days. Schleicher and the Varma brothers decided to shift the Press away from the disturbances of Bombay and bought a few acres of land at the foot of the mountain near Bhaji village to build a new workshop there. Fritz Schleicher (1862-1935) came from Berlin. It is not known how Ravi Varma recruited him. It is likely that Dadabhai Naoroji was instrumental in the acquisition of the machinery, as well as the selection of the German master printer. That Schleicher was an expert lithographer can easily be understood from the quality of the earliest prints which the Ravi Varma Press turned out. He introduced the required infrastructure necessary to run the steam-driven lithographic machinery and maintain the biggest capital of the Press, the store of lithographic master stones. The working language in the Press was German, as the markings on the original litho stones show. Schleicher played a pivotal role in the Press. Under his guidance the Press was dismantled, shifted, and re-assembled at least twice between 1898 and 1901, first to move it away from the plague-ridden downtown Girgaum to a shed in Ghatkopar, which was then beyond the Bombay periphery, and later to the new premises near Bhaji village close to Lonavla. Under his strict supervision, the Press became the largest picture-printing establishment in India. The quality of the prints was very high and could easily compare with imported prints from Germany. For the transfer of the pictures to stone, Schleicher relied on the artistic abilities of another German lithographer, P. Gerhardt, who was also a talented painter. Although not much is known about him apart from a few entries in the diary-not even his given name is handed down; it is only the cryptic 'P'-two large paintings survived in the premises of the Ravi Varma Press and one in the Jayachamarajendran Art Gallery in Mysore. He was a master of foliated backgrounds, an asset which came in handy for the setting of the Puranic genre pictures. If Gerhardt was a master of the backdrop, Schleicher was known as a master of rendering human figures to the stone. Schleicher and an Indian foreman-Shriram Pant, a friend of the Varma brothers-leased the Press in 1901 and Schleicher became the sole owner after 1903; from then on there was no looking back. Under the strict supervision of Schleicher and his team of German printers, the Press became a virtual gold mine. Schleicher ran the Press with a patriarchal hand, leading it to financial success. He was soon the patriarch of the region of Malavli, living in style with a large cellar, well stocked with German beer and wine and a couple of mistresses. As a shikari; he would go after panthers and other big game in his own hills with his own band of faithful beaters (Plate 29A), who, during workdays, doubled as labourers on the steam-driven lithographic presses churning out icons of their gods. The initial two acres of ground near the well at the foot of the hill grew to encompass the whole hill and large chunks of lowland. The technical heart of the Press consisted of two steam- driven lithographic cylinder speed-presses, which could produce up to 800 impressions per hour (Plate 30B). Tinting and traction of the stone was mechanized, and feeding the paper to the cylinder as well as receiving the printed sheets was daily wage labour, cheap labour, labour to the stomping of the machine. The large formats were done in thirteen colours, which meant thirteen successive print runs for a single picture and a final run through the varnishing machine, to give extra gloss. Every litho press was manned by four persons besides the printer, who was the only permanent employed person, while all the other labourers were employed on daily wages. When Schleicher died in 1935, the Press had become a famous institution, well-off financially. Schleicher's will included immovable property in Germany and India and considerable assets in stocks and cash managed by the German Bank. His memorial tomb in the hill above the Press is surrounded with pines, the closest he could get to German fir trees, not far away from his beer cellar-which he had cut out from the tough basalt of the Deccan, large enough to stock a year's requirement of ice beer and German lager, and almost as deep as the Buddhist rock-cut caves on the other side of the hill. If Ravi Varma carried the title 'Painter of the Celestials', then to Schleicher should go the epithet 'Printer of the Gods'.